1. I am safe in the Master’s Hand. Colossians 3:1-3 – Since you have been raised to new life with Christ, set your sights on the realities of heaven, where Christ sits in the place of honor at God’s right hand. Think about the things of heaven, not the things of earth. For you died to this life, and your real life is hidden with Christ in God. 2. 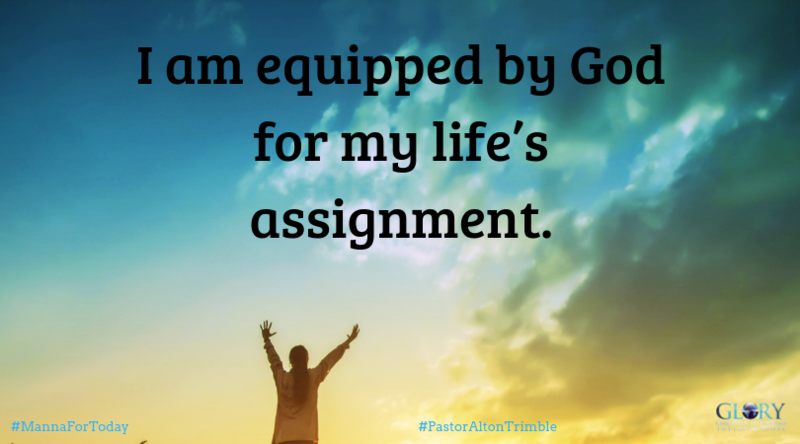 I am equipped by God for my life’s assignment. Romans 8:30 – And having chosen them, he called them to come to him. And having called them, he gave them right standing with himself. And having given them right standing, he gave them his glory. Ephesians 4:11-12 – Now these are the gifts Christ gave to the church: the apostles, the prophets, the evangelists, and the pastors and teachers. Their responsibility is to equip God’s people to do his work and build up the church, the body of Christ. Philippians 2:5 – You must have the same attitude that Christ Jesus had. Philippians 4:6-7 – Don’t worry about anything; instead, pray about everything. Tell God what you need, and thank him for all he has done. Then you will experience God’s peace, which exceeds anything we can understand. His peace will guard your hearts and minds as you live in Christ Jesus. 5. I am resolute in my knowledge of God’s plans for my future. 6. I am exponential in my thinking related to my future. Lord thank you for this beautiful Manna for today. Thank you Lord for keeping me safe and equipping me for my life’s assignments. Help me to remain Christ-minded at all times. Guide me Lord as I remain undisquieted in everything I do! Help me to remain resolute in my knowledge of your plans for my life and lastly, let me always think exponentially when thinking about my life and the life of my family! In Jesus mighty and matchless name, Amen! Father, thank You for beginning a new thing in me and I know You are well able to complete it. Help me to keep my eyes on You so that I may follow and not get ahead of You. In the name of Jesus, Amen. Father God we are safe everyday in your arms, thank you Jesus!! Thank you Pastor Trimble for the manna everyday. Amen & Amen!!! !